This titanium belly bar features a small sterling silver, black and clear crystal butterfly and three tiny teardrops hanging from silver chains, and comes with a matching black jewelled screw on top ball. 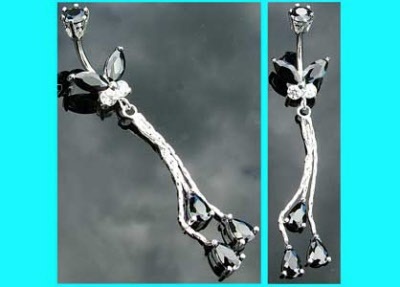 These belly bars are available in a 6mm, 8mm, 10mm or 12mm size. Powered by ShopFactory to sell P12284 online. All-in one eCommerce and online shopping cart software.